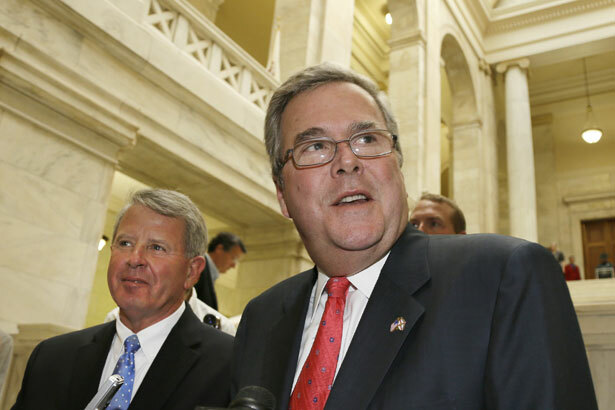 Could Jeb Bush Be the GOP’s 2016 Savior? With Chris Christie in hot water, big donors in the GOP are turning to another Bush. With Chris Christie flailing, is there another governor in the wings? Or an ex-governor, perhaps? I get the point. It’s something that, if I run, I would have to overcome that. And so will Hillary, by the way. Let’s keep the same standards for everybody. One difference being: Bill Clinton’s presidency was, if not a major success, at least modestly successful—while George W. Bush’s presidency was a catastrophe. In any case, if Bush does run, it’ll be because the mainstream Republicans and the big donors behind the GOP need someone else to carry their water against the insurgents of the Tea Party. For many of them, both in 2011 and again today, Christie was seen as the savior who could stop any of the tea-drinking Republican Senate freshmen—Marco Rubio, Rand Paul and Ted Cruz—from making a serious bid. Other possibilities include Scott Walker, the union-busting governor of Wisconsin and John Kasich, the center-right Ohio governor, but neither of them is particularly exciting or has much name recognition. Could it be another Bush? In fact, it’s too soon to write Christie off: He might be able to recover from this mess (as long as there continues to be zero evidence that he had any idea his flunkies had snarled traffic approaching the George Washington Bridge to punish a political opponent). But the Wall Streeters I speak to (people with direct access to Christie and his inner circle) say the Christie presidential campaign is clearly on life support: They think he’s in the clear himself, but the stench from the scandal is starting to look impossible to overcome. They cite the cool reception Christie has been getting recently from Republican establishment types outside of his home turf in the Northeast, and the fact that many fund-raisers are now looking to former Florida Gov. Jeb Bush as the party’s savior. [Bush] has said he’s going to think about 2016. A lot of people think he’s not serious, he just likes the spotlight, that he won’t want to run. But I will tell you this: I spoke to several Republican fundraisers this week who got phone calls from Jeb Bush, the former Florida governor, who hasn’t said he’s going to run but is starting to ask some serious questions. So people think that at least he’s giving it a very serious look. Perhaps the biggest GOP funder of all, the ultra-right, hardline pro-Israel hawk and casino billionaire Sheldon Adelson, will have a say. Next month, under the watchful eye of Adelson, several Republican hopefuls—including Christie, Walker and Kasich—will travel to Las Vegas to appear at the Republican Jewish Coalition’s for its annual spring meeting, which boasts Adelson on its board of directors, along with other wealthy conservatives such as hedge fund magnate Paul Singer. And, according to the RJC, Jeb Bush will speak at a VIP dinner for big contributors. The save-the-date notice that went out last week about the dinner, which is to take place in May, will only add to speculation about whether Mr. Bush intends to run for president in 2016. If he does, accepting the Manhattan Institute invitation is a smart move—it will provide Mr. Bush some valuable exposure before a large audience of right-of-center donors and intellectuals. But, as Stoll points out, Bush “went to work for Lehman Brothers in 2007, which was poor timing.” Indeed. Bush’s speeches are getting better, tighter, and more campaigny, from what I’ve noticed. I still think Jeb is only a three-in-ten shot to go, but if you’re in his shoes, and Chris Christie has taken a huge hit in stock value—wouldn’t you wait and see? If Christie survives and runs, it’s a harder proposition by far, obviously.